NACLA blogger Peter Watt interviews John M. Ackerman, professor at the Institute for Legal Research at the National Autonomous University of Mexico (UNAM), Editor-in-Chief of the Mexican Law Review, and columnist for Proceso magazine and La Jornada newspaper. Peter Watt: Twenty years after the North American Free Trade Agreement (NAFTA) came into effect, the administration of Mexican president Enrique Peña Nieto is accelerating a deeply unpopular process of neoliberal reform. To what extent does the return of the Institutional Revolutionary Party (PRI) in Mexico represent a cross-party and cross-border strategy of political and economic integration and how do you view the recent resurgence of the PRI? John Ackerman: The remarkable thing about the transfer of power from the National Action Party (PAN) to the PRI in 2012 is the lack of any kind of real change in drug war policy. It shouldn't be a surprise because we haven't really had a regime change or even a democratic transition in Mexico. When the PAN took power in 2000 it was very much a continuation of the neoliberal PRI policies of the 1980s and 1990s. At the level of PR and public speeches, Peña Nieto claimed he was going to bring about a radical change in policy. In many ways his discourse used the same terms as the critics of ex-president Felipe Calderón's drug war. Many in the No Más Sangre (No More Blood) movement, which argued against the disastrous military strategy, emphasized that public security policy should focus on the Mexican people, on peace, and harm reduction and that it should not be an extension of the U.S. border patrol nor should it represent U.S. business interests. Mexican sovereignty should be about the welfare of the people and law enforcement should work to that end. Linked to this is the whole issue of militarization. Felipe Calderón rolled the military out to the streets at the very beginning of his presidency with the Operativo Conjunto Michoacán (Operation Michoacán), which is ironic given what's happening there today. When Peña Nieto comes in, he supposedly responds to critiques about crime and violations of human rights. The problem is that it is just pure window dressing. Politics have been exactly the same—he has not taken the military off the streets, but has increased the military presence. He has not reduced collaboration with the U.S. government, but increased it. There’s nothing new, for example, about drones flying over Mexican airspace without congressional approval. What is different about this administration is that it does what Calderón did but more blatantly, challenging the traditional—but also progressive—way of thinking about sovereignty and national development in Mexico. PW: What do you think the rationale is behind U.S. support for the current catastrophe? JA: Mexico is already an occupied country in some ways. We are invaded and infiltrated by the U.S. intelligence and military apparatus. U.S. drug agents and military are armed in Mexican territory (which is illegal). They have intelligence centers all over the country and they fly drones. Mexico is fully integrated into the North American military strategy with the full compliance of Mexican officials. The capture of El Chapo Guzmán was a joint operation, if not a U.S. operation with Mexican help. And the 100,000 dead and the 24,000 disappeared are the direct result of policy. This is not something that just happens, even in a country with drugs. U.S. policy and the profound economic and political complicity on the part of the Mexican elite have meant that violence is contained south of the border. The United States does not want this violence to spill over and the best way they have found to control it is to make sure it is confined to Mexico. It has been compared to the “dirty war” against activists, guerrilleros, peasant groups, indigenous movements, Marxists, and socialists of the 1960s and 1970s. But it’s also an assault on the ideals of the Mexican Revolution of 100 years ago. The Constitution, which was written in 1917, is actually very good and was the first in the world to institutionalize a whole series of basic rights. It includes, for example, Article 123, which guarantees the right to dignified and socially useful work and an eight-hour work day. We have the right to oil proceeds. What is fascinating about the Mexican Revolution is that it is surprisingly modern and progressive. It is based on the separation between Church and State and on defending human rights, labor rights, the right to education, to healthcare, and today it’s updated to include provision of a healthy environment and access to information. It is an incredible document, which of course is not applied, but it is an interesting reflection of the progressive spirit of Mexican culture. Yet now we see a systematic attack on the legacy of the Mexican Revolution. The Revolution is not something old, which is no longer relevant today. We have a very active public sphere and still a discourse of the defense of the public and social rights, which is still very dominant despite the incredible TV duopoly of Televisa and TV Azteca. So there is a real danger for the interests in Washington of Mexico turning towards South America. South America at present is the place of democratic innovation in the world. In no other continent are so many interesting things happening in terms of progressive constitutionalism and movements. PW: You mentioned that U.S. and Mexican elites fear that the democratizing innovations taking shape under left-wing governments in South America might spread. Keeping Colombia and Mexico as key strategic allies appears to be integral to offsetting that possibility. JA: Exactly. In Latin America, Mexico and Colombia are the major exceptions to the leftward trend, which is based on the absolute failure of neoliberalism to bring social, political, and economic development to the region. That’s what NAFTA was about, that’s what the Tres Amigos Summit a few weeks ago was all about. These summits are incredibly false because they are strictly symbolic. Nothing is actually being negotiated because the interests of all parties are exactly the same. Nothing is happening—or rather, everything is happening, but not at the summit. PW: Among the latest developments has been the rise of self-defense groups in the state of Michoacán. There are many vibrant and courageous social movements throughout the country but they remain fragmented. Were they to coalesce, could we see a kind of Mexican Spring develop? JA: The self-defense forces in Michoacán are very interesting. There are two questions to consider here. The first is the kind of grassroots self-management which is designed to defend communities from organized criminal gangs. They draw on a long tradition of organizing in which many indigenous communities put together policías comunitarios (community police forces). People were very quick to see them as communities rebelling against the corrupt government and the police, an extension of the policías comunitarios. On the other hand, another viewpoint is that they are conducting a kind of proxy war run by paramilitaries but directed from Washington, a kind of Colombianization of the Mexican drug war. The interesting thing about the autodefensas is that they don’t fit either of those characterizations. They are not strictly grassroots and they are not strictly indigenous—they are linked to business, to the wealthy avocado and lime growers. They do have a strange relationship with the government, but more recently this has turned into an open and clear alliance. In the last few weeks they have been trailed by local and federal police. How it will play out in the immediate future is difficult to say because we don’t who’s talking and when. One minute the autodefensas will be very critical of the corruption in the police and government and yet the next minute a spokesperson comes out and says that they’re very happy to have their support. So this is what creates the suspicion that they are in fact a creation of Washington. But the important thing to remember is that while there is more of an intimate connection between narcotrafficking and leftist rebels in Colombia, in Mexico the situation is the other way around. The narcos in Mexico are on the side of the government. And there’s no alliance between narcos and social movements in Mexico. The other thing that’s different is that the autodefensas actually have deep grassroots support in Mexico, while in Colombia they were armed mercenary paramilitary groups. That’s what makes one think that they have in the end taken Peña Nieto and Washington by surprise. The fact that they are armed warriors, that they have this relationship with their communities and that the narcos are on the other side suggests that there is potential to detonate other similar autodefensas elsewhere. The Congreso Popular, which is a group of leading journalists, intellectuals, and radical civil society organizations and in which I am involved, uses the metaphor of a “national autodefensa.” This idea is catching on around the country, but the problem is always the government’s divide and rule strategy. We have seen some major movements in the last few years, from ex-presidential candidate Andrés Manuel López Obrador, to the Yo Soy 132 student movement, to the No Más Sangre movement led by the poet Javier Sicilia, to the teachers’ movement last year. Mexican society is very active and I think it’s a question of time before it coalesces. We are pushing for the redemocratization of democracy. 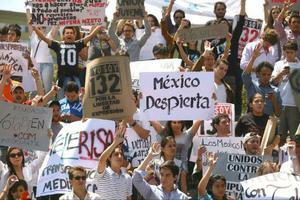 The Mexican population is not with Peña Nieto or the political class. Even the polls, which are generally most sympathetic to the president, accept that no one supports Peña Nieto. The political class seems to think it’s just because the economy hasn’t grown, but it goes far beyond that. Mexicans aren’t that easily fooled—it’s not a generalized apathy but instead a sense of disempowerment. PW: The arrest of the leader of the Sinaloa cartel, El Chapo Guzmán, is an important PR victory for the government, and they’re attempting to use it to divert attention away from the oil reform, security issues, and poverty. Does his arrest really change the structural factors behind the drug war? JA: The newspaper El Universal recently used U.S. court documents to demonstrate that it wasn’t only Calderón who was allied with El Chapo Guzmán. It was a coordinated strategy between Obama and Calderón to favor the Sinaloa cartel and was completely consistent with Calderón’s strategy from the beginning to tie all law enforcement policy to the United States. We don’t have to get into conspiracy theories to understand what’s happening. From their point of view there is a need to administer the drug war. Nobody thinks they can end the flow of drugs from Mexico to the United States. Any strategy the government develops is going to be one that is designed to control violence and manage the profits. The deal was at least to turn a blind eye to El Chapo’s dynasty in exchange for attacking what they considered to be more violent and bloodthirsty gangs like Los Zetas. What this led to was an incredible explosion in the power of some cartels. In a way the government felt the need to reduce El Chapo’s hubris in order to manage this incredibly lucrative but violent industry. Now that El Chapo is gone, another capo (cartel boss) will fill his place. It’s typical “business as usual” and there’s nothing about it that indicates a change in strategy, a movement towards the rule of law, or a change that promotes peace or the security of the Mexican people. Peña Nieto is absolutely at the service of the interests of the people who are behind the U.S. government. It’s remarkable, for example, that none of them said anything about the NSA spying when it turned out they had been spying on ex-President Calderón and reading Peña Nieto’s text messages. Just after he was elected, Peña Nieto published an Op Ed in The Washington Post about how Mexico was moving towards total North American integration in every shape and form: political, military, energy, and economic. That is the project of the ruling class in Mexico. My hope is that the Mexican people—some 120 million people, many of whom are in the United States—draw on that rebellious, sovereign, Latin American consciousness and articulate it on both sides of the border. It really needs to happen in order to put some limits on the strategy of corporate integration. Our movement should be about defending Mexican sovereignty and taking advantage of the links that already exist in both countries in order to develop a more progressive politics. If we’re successful it would be highly beneficial to both Mexico and the United States. Peter Watt teaches Latin American Studies at the University of Sheffield. He is co-author of the book, Drug War Mexico: Politics, Violence and Neoliberalism in the New Narcoeconomy (Zed Books 2012).